Everybody has a favourite recipe to make pumpkin pie and this is mine. I use double cream rather than condensed milk in order to get a creamier texture, it is a little like a cheesecake texture rather than a gelatinous texture. I brought four tins of Libby’s pumpkin puree with me to Norway and I am so glad that I did as you can buy it here but it costs £6.50 per can! I also brought chestnut puree with me and that is also £6.50 per can so I have to make them last. One thing I am really impressed with in Norway is the dairy products, the butter here is fantastic. When I was growing up there was always a running joke in my family that I show bread butter rather than spreading it on as I spread it on so thinly, this is quite a change now as I easily get through a block of butter of week, if not more depending on how much baking I am doing. I always use butter in my baking and not margarine or any other spreads and I always use salted butter even if a recipe states unsalted. I find that the little bit of salt really brings out the flavour in baking. Aside from butter the milk and yoghurt is good too. Cheese on the other hand is hit or miss, I had a wonderful brie type cheese but the everyday cheese is awful, it tastes like plastic. I really miss cheddar cheese, I didn’t think I would but I constantly find that I wish I had some. I like to have pumpkin pie chilled rather than warm but if you prefer it warm it can also be eaten that way too. I’m not sure if the spices I use are traditional pumpkin pie spice blend but I use what my fiancée likes, so that means lots of cloves. 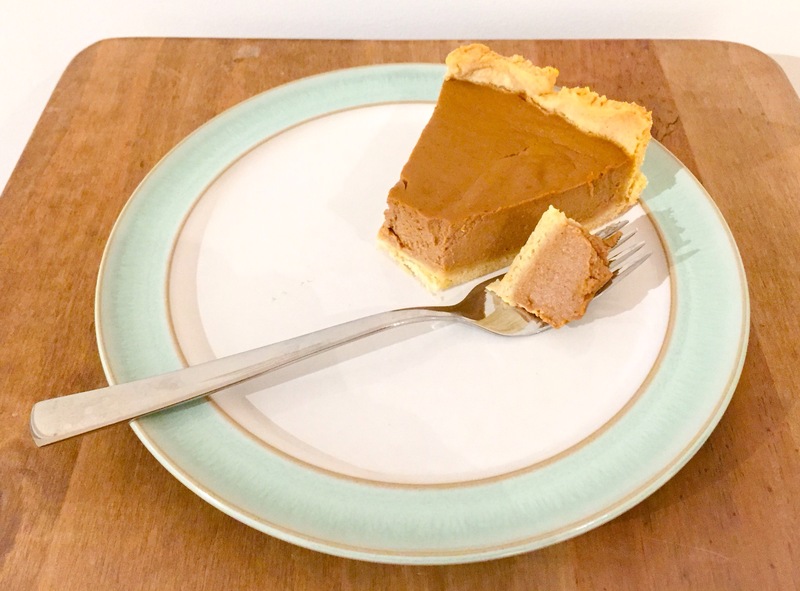 I have used a plain shortcrust pastry rather than a sweet one as I don’t like desserts that are too sweet but it can easily be changed for a sweet shortcrust pastry. Pre-heat the oven to 200C. Place the flour and butter in a bowl and mix with fingertips until it has formed a bread crumb texture (or place the flour and butter in a food processor and blitz). Slowly add water until the pastry starts to come together. Quickly and gently form into a ball and then wrap in cling film (food wrap) and chill in the fridge for 30 minutes. Once the pastry is chilled roll it out and place it in a 24cm/12inch fluted tart dish, cover in grease proof paper, add baking beans and blind bake for 20 minutes. While the pastry is baking make the filling. Whisk the two eggs in a glass bowl. In a pan heat the cream, sugar and spices until simmering. Add this to the eggs and whisk in, to ensure the eggs don’t curdle. Mix in the pumpkin puree. Once the pastry has cooked pour the pumpkin filling into the pastry. Turn the oven down to 180C and cook for 30 minutes until it is set at the edges but still wobbles in the middle.